Business communication expert and bestselling author Dianna Booher shares practical wisdom on how to write effective emails that get results and how to organize documents to gain control and increase your productivity. Today, most business writing is email writing. We handle even our most important customer transactions, internal operations, and supplier partnerships solely by email. Yet many of us still struggle to write emails that get results. And we often are so overwhelmed by the sheer volume of emails that we feel as though we’re in email jail! How we handle email has a big impact on the trajectory of our career. Emails can build or destroy credibility, clarify or confuse situations for our coworkers and customers, and reduce or increase security risks and legal liabilities. This book will help you master your emails and stand out as a clear, credible communicator. After all, clear, credible communicators become leaders in every industry. With more than three decades of experience analyzing emails across various industries for corporate clients, Dianna Booher offers guidance on how to identify and stop email clutter so you can increase productivity while improving communication flow. This book will open your eyes to a whole new way of thinking about email—its purposes, structure, improper uses, security risks, and productivity strategies. Dianna Booher is the master of her craft, the communicators’ communicator, the go-to person for getting your point across memorably, efficiently, and effectively. With Faster, Fewer, Better Emails, she’s delivered another winner and one you can put to use immediately. It’s got a clear and concise format, practical tips, relevant examples, and a sound strategy for saving time and aggravation. Read this book now and earn immediate thanks from your colleagues and business from your customers. 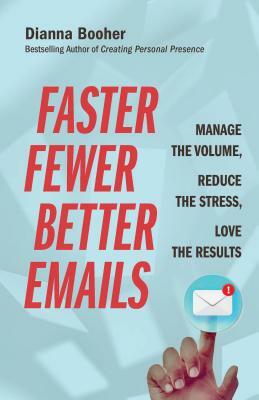 Booher delivers another winner: practical strategies and tips to manage email volume, reduce the feeling of being perpetually overwhelmed, and promote clear communication. Author of Eat That Frog! Email has become an omnipresent part of our professional and personal lives, so it’s easy to treat it carelessly. This book is a great reminder of how email impacts not only your productivity but your professional reputation and even your security and that of your company. I’ll be implementing Booher’s strategies for me and my team. The incredible Dianna Booher has done it again, providing her unique wisdom and remarkable insights in the ways that only she can. Bravo! If you’re a busy executive, have your team read and implement the strategies in this book. The productivity increases for you—and them—will be startling. Finally, a way out of email jail! Seriously, the strategies in this book can cut your email time in half—and improve communication flow. Practical strategies and tips to get real 24-7 communication gains from email and eliminate the productivity drain it all too often creates. . . . Another hit from Booher. Dianna Booher has written a must-read book for anyone drowning in her email box. She provides practical advice and tips to master your email in today’s digital world. Chief Compliance Officer/Managing Director, SMBC Capital Markets, Inc.